It's been over three years since I painted at Defender's Parkway in Pasadena. 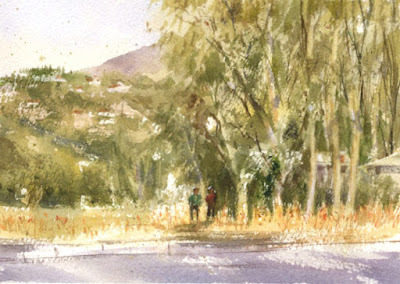 On that visit I looked to the east and tried a watercolor of a distant glimpse of downtown Pasadena, Defenders Parkway. Since this small park is located at the main intersection of the Tournament of Roses Parade, bleachers were already set up for the New Years Day parade so a view to paint in that direction was out. There are miles of bleachers to be set up before January 1st. so they start early. Checking the west side of the park for a view to paint, there is the Colorado Street Bridge entrance, foothills and hillside homes, and a freeway offramp. I really liked a view across the freeway offramp to some eucalyptus trees and a distant hillside for my small watercolor. While we painted, it was fun to see photographers coming by with clients for photos on the famous bridge. 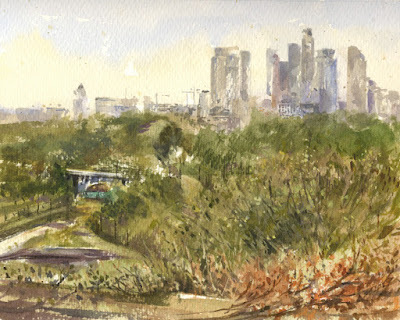 A few weeks ago the paint-out group had Angel's Point in Elysian Park on the schedule. Elysian Park covers some hills with wonderful views overlooking much of Los Angeles. I tried painting there a few years ago but never found Angel's Point what with the maze of windy roads and smaller hills. Unfortunately on this visit the gate to Angel's Point Rd. was closed. No problem. We found Grandview Point which has terrific views of downtown L.A. to the south, and the foothills to the north. An ariel tramway was proposed to Grandview Point a few years ago. 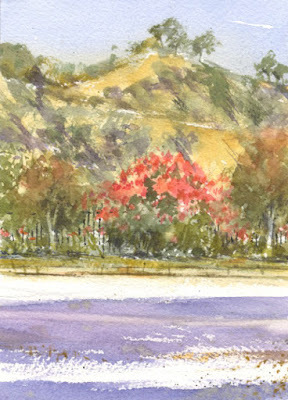 I decided to paint a watercolor of the vista I could see through the trees and bushes from the hilltop. Great views! A few weeks ago the paint-out group returned to the Los Angeles River Center and Gardens. Unfortunately the gates were closed. Many events, especially weddings, are held there because it's such a beautiful venue. A wedding was going to be set up so we had to find a view to paint from outside the gates. 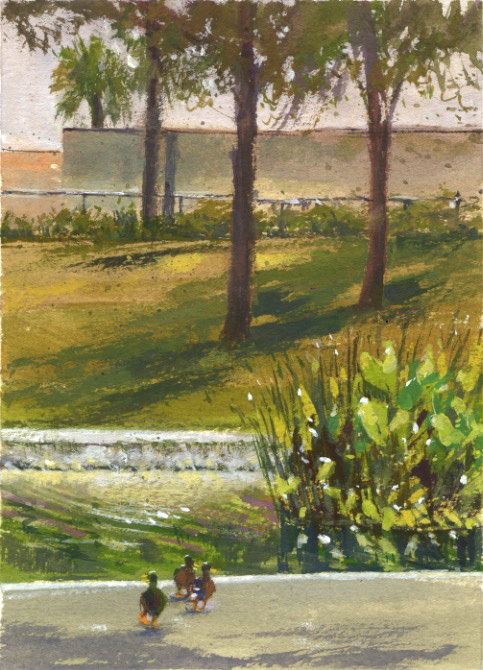 My previous completed painting was LA River Center. On two other paint-outs we were told we had to leave in an hour for wedding preparations so I didn't finish my paintings. Luckily there are many appealing views outside of the gates at this location. The bougainvillea plants were bright with magenta flowers. I decided to try a view of the hillside across the street which had some interesting elements that I like to include. Hopefully the center will be open on our next visit. It's hard to believe that it's been four years since I painted at Hollenbeck Park, Hollenbeck Park Return. 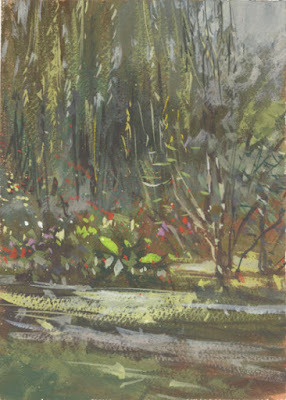 The Saturday paint-out group returned on a pretty day a month or so ago. The park is quiet in the morning and I love the lake with the many park birds...pigeons, ducks, and geese. As usual it took me a while to choose my view to paint. The palm trees surrounding the park are so beautiful, and the remaining part of the old boat house is appealing. I found a nice spot under a tree with a view across the lake, including many birds. As we were finishing our paintings some people with food for the birds arrived which brought them all. 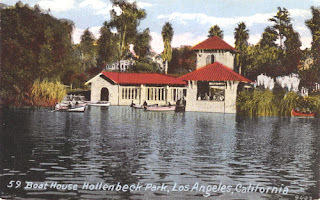 Vintage postcard of the old boat house. 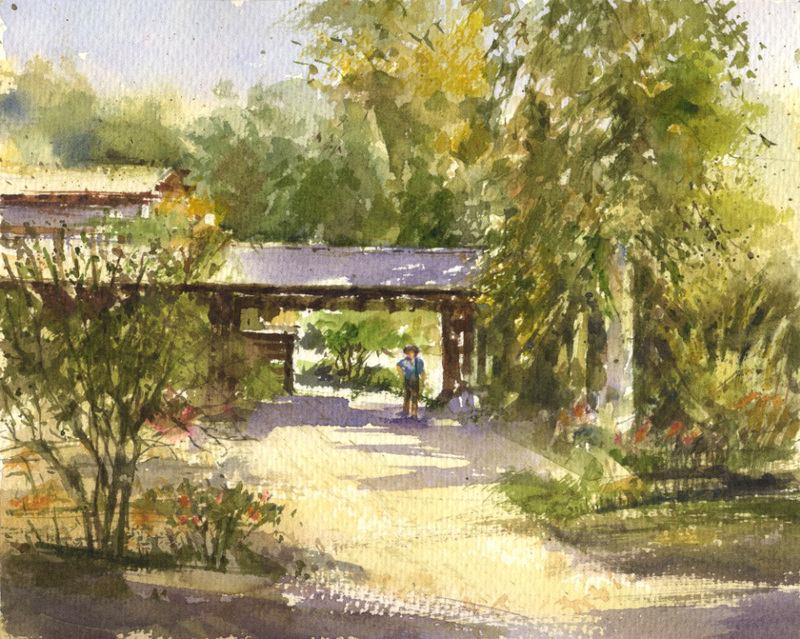 In September I returned to Descanso Gardens with one of the paint-out groups. I can't believe I haven't posted a painting from there for over a year, my last piece, Descanso Train. Coincidently the Enchanted Railroad train caught my eye again for a few photos. 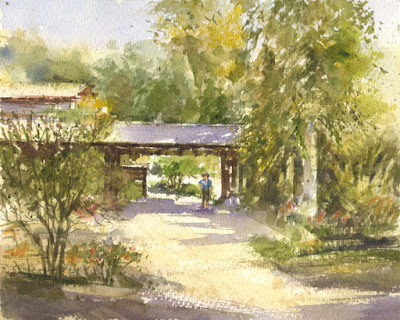 I decided to try a watercolor of the Rose Pavilion entrance, the center piece in the rose garden. 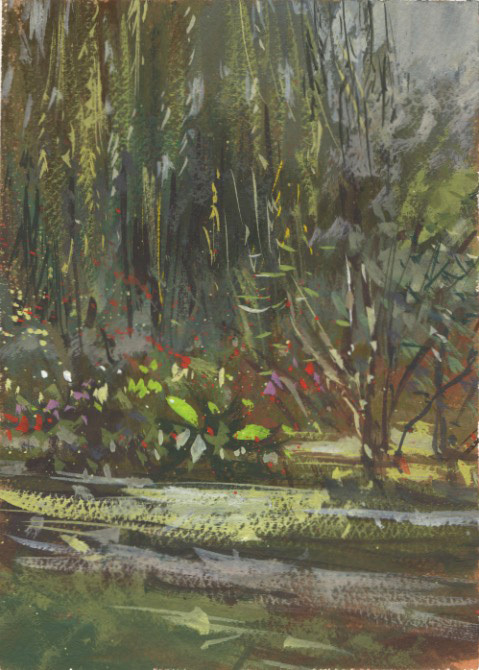 There is a huge willow tree next to the pavilion that I painted in gouache a few years ago and never posted it on my blog so I'll include it today. Descanso is on the painting scheduled again...so many views to paint there.